Wind gets ducks moving, but it can also be extremely dangerous. The author learned this the hard way. October 27, 1988, promised to be a remarkable day. Vice-president George H. W. Bush was rolling over Michael Dukakis on his way to the White House. The classic movie ET had just been released on home video. And a strong weather pattern had blown into the Midwest, sending temperatures plummeting and winds soaring. My buddy Jay and I didn’t care that much about ET, and we’d pretty much hashed over all the presidential campaign news early 20-something guys cared to absorb. But the weather had us fired up. Big late-October fronts in central Wisconsin mean diving ducks, and Jay had a new layout boat and 14-foot jon boat as a tender craft, so we intended to cash in on open-water bluebills. We’d only used the layout a few times that season, but it had gone well. Our mentor, Gordy, a salty old-time open-water expert, had taught us how to make gang-rig decoys and place them, and we’d learned a few crude boat-control skills. And we’d killed some ducks every time out. But despite his wisdom, Gordy couldn’t teach us common sense or respect for Mother Nature, nor could he warn us that morning that hard lessons about both awaited us on the rolling whitecaps of 137,000-acre-plus Lake Winnebago. Jay and I launched the boat at sunrise and set out to the east. Immediately, the stiff south/southeast wind hammered our small craft, rocking us up and down. One gust even blew off Jay’s stocking cap — perhaps a sign from the almighty that we ignored. Undeterred, we motored to a reef about a mile out and started setting out decoys. The boat’s bow crashed up and down in the waves when we motored upwind, yet we continued. Finally, I set Jay in the layout boat and motored behind him to watch. I noticed immediately that our small anchor didn’t hold the tender boat. In fact, with the wind and waves increasing, the craft bobbed downwind at a pretty good clip. But Jay soon shot a bluebill, so I motored to him and picked it up. Minutes later, he shot another, so I again zipped toward the spread. But something was different. Jay’s face seemed ashen as he motioned me toward the layout. I had enough sense not to argue, so Jay jumped in the boat, and we picked up the decoys. That went fine. Then, we motored around to retrieve the layout boat. The gale-force breeze blew us back past the boat before we could grab it, so Jay reflexively popped the motor in reverse and backed toward the craft. Water began crashing over the stern. At first, we laughed it off, but when we noticed decoys floating in the almost-swamped jon, things became very serious. We were sinking. Then the motor stalled. Jay tried to re-start it, but his half-panicked attempt failed. I realized we were seconds from plunging into the icy, roiling lake, where we’d die in minutes from hypothermia. But then Jay revealed a bit of knowledge that saved our bacon. “Jump in the layout boat,” he yelled. With that, he jumped in the layout. I ran toward the stern but foolishly stopped and grabbed my gun. The jon boat was sliding downwind quickly, so I placed my foot on the gunwale and dove headfirst to the layout, barely grabbing the cowling as my legs dangled in the water. After I shook off the impact, we turned to see the jon boat had capsized and was floating bow-up in the whitecaps. Loose decoys and Jay’s shotgun were scattered across the lake’s surface. Worse, two 200-pound dudes had crammed into a tiny craft meant to hide one person, and waves crashed over the layout, which was held solidly in place by heavy river anchors. We’d swamp in minutes. Suddenly, I remembered my hunting knife, which I always carried for no apparent reason. Without speaking, I cut the ropes to the fore and aft anchors, setting the layout adrift in the storm. We were soaked and petrified but alive, riding the surging whitecaps on an inland sea. For the next 90 minutes, the powerful waves drove us up and down as we sailed northwest toward shore. I used a decoy-line storage board to paddle while Jay held the layout’s canvas cowling high, deflecting many of the crashing whitecaps. Our hands froze numb, and our spirits plunged as we watched Jay’s boat and all of his gear sink or blow away. But as we cleared a large point that broke much of the wind, we began to realize that we’d make it. Eventually, the storm blew us into a shallow bay, and we jumped out and walked the layout to shore. A lakeside homeowner ambled out to greet us, concerned, we thought, for our safety. “Well, did you get any?” he said. The neighbor had also seen us blow ashore, and she let us use her telephone to call Gordy. Another concerned observer had contacted the sheriff’s department, and a deputy met us at Gordy’s home. After realizing we were stupid but alive, he left. Gordy then used his boat to retrieve the jon boat, two decoys and one of Jay’s ducks. All the other equipment was lost. Shell-shocked but amazed at our fortune, we went home and tried to absorb everything. Almost 30 years later, it still seems surreal. We didn’t layout-hunt for a year after that, and when we did, it had to be almost calm. During subsequent seasons, we cautiously learned the game, acquired far better equipment and developed some sense. We knew when to hunt and when to wait for better days. And we always looked back, grateful we’d been given the chance at that hindsight. I don’t need to spell out the moral of this tale. You already know we were young and far too gung-ho. We ignored obvious warning signs and tempted dangerous conditions because we were headstrong. We wrecked gear, scared the hell out of our families and courted death in the hopes of shooting a few ducks. The weatherman said winds gusted to 40 mph that day and blew sustained at about 25 mph. It had been too rough for shoreline hunting in an onshore wind, let alone an open-water trip. Years later, three young men died during similar conditions while hunting in a jon boat not a mile from where we’d had our accident. Jay and I didn’t need to say anything about that tragedy. If not for his quick thinking and my knife, our tales would have been identical to that of the youngsters. 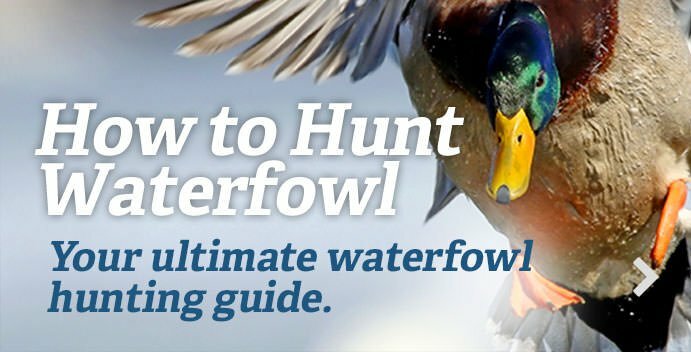 Want my advice about whether to hunt dangerous water in bad weather? It’s simple: If you even have to think about it, don’t. Wait till tomorrow. Or next week. Or next year. You’ll always have more chances to hunt ducks. The reaper doesn’t extend many second opportunities.